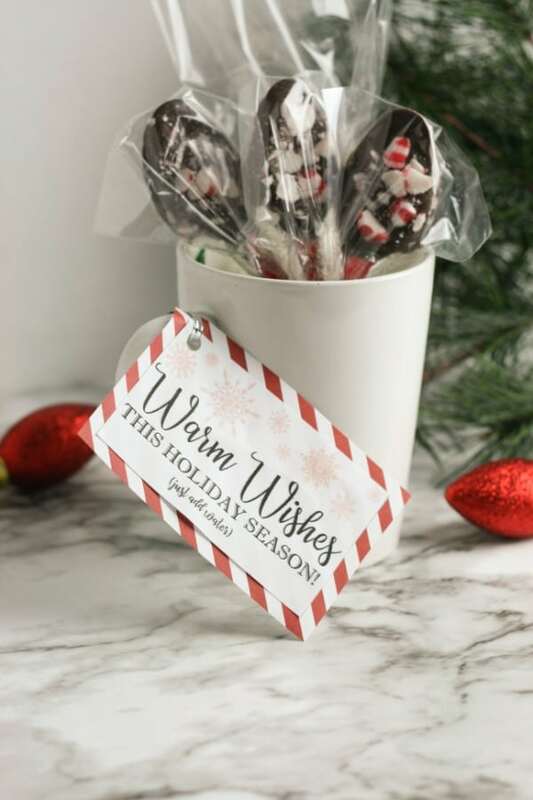 This DIY Hot Chocolate Gift with Peppermint Spoons is an easy gift that’s perfect for almost anyone. Who doesn’t love a delicious mug of hot cocoa? 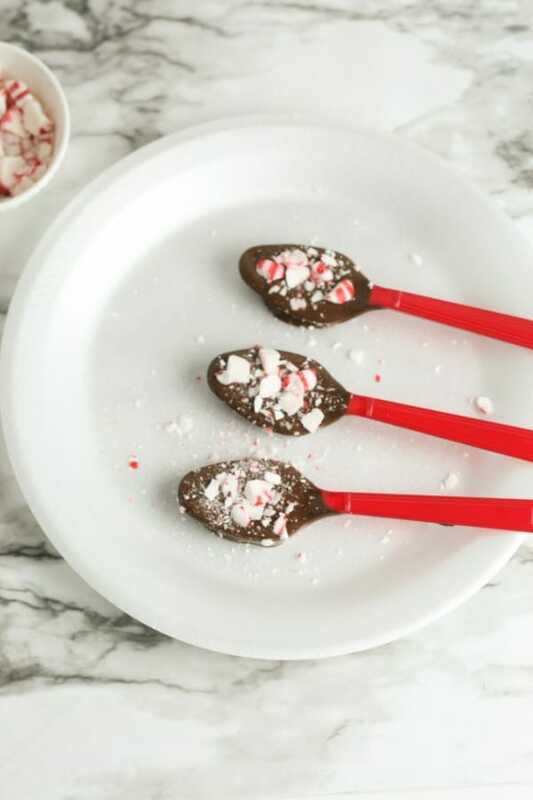 My daughter wanted to make gifts for her friends this year and I suggested she make DIY Hot Chocolate Gift with Peppermint Spoons for each them. We knew her friends would love the gift, the fact that she was making them herself (with a little help from me) added a personal touch, and they’re really cute when they’re all packed up! If you’re looking for an easy, inexpensive gift that will work for almost anyone, this gift idea is for you! 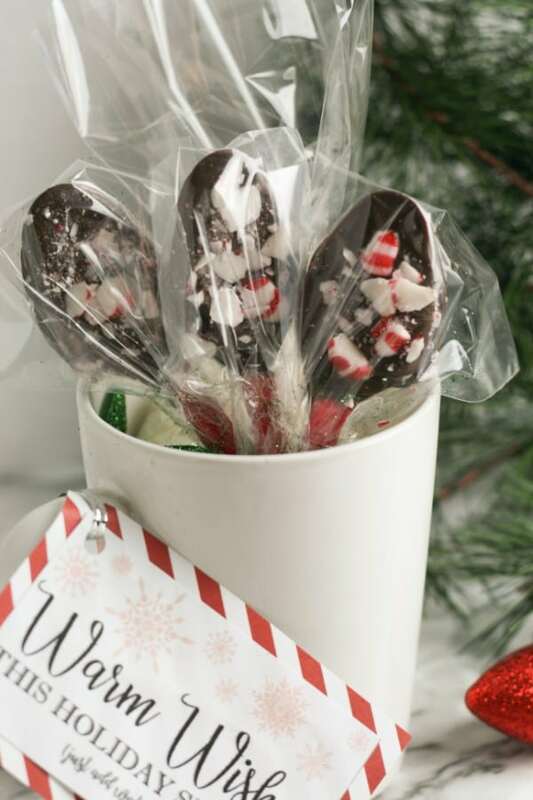 There are two parts to this gift — the homemade cocoa mix and the peppermint spoons. After you’ve made each of them, you’ll put them together to create this adorable gift. It’s really easy to make your own hot chocolate. The cocoa mix is a made from a few simple ingredients and then we layer on the fun stuff (chocolate chips and mini marshmallows). First, we need to make the hot chocolate mix. 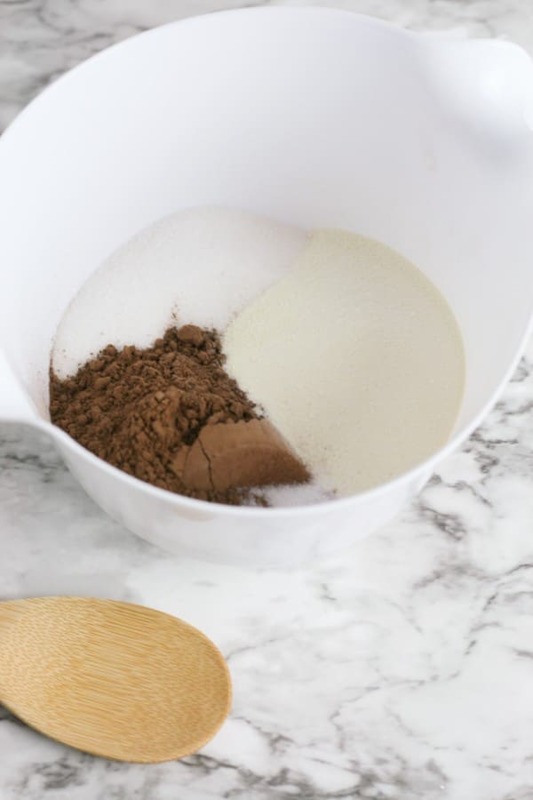 Combine the sugar, baking cocoa, powdered milk, and a pinch of salt in a bowl. Mix well and add 6 tablespoons of the cocoa mix to each plastic baggie. If you want to make this gift even easier, you can skip the homemade cocoa mix and just use store-bought. My daughter really wanted her gifts to be “homemade” so we opted for the DIY version. Next, add a handful of mini chocolate chips on top of the cocoa mix. Finally, add a handful of mini marshmallows on top of the chocolate chips. Secure the top of the bag with a twist tie to close. Twist the top of the bag closed. For a male reindeer, use a twist tie to secure the top of the bag. This is the fun part. And, in my opinion, the part that makes this gift extra special. First, follow the directions on the package of your melting chocolate to melt the chocolate. Next, dip each spoon into the melted chocolate. 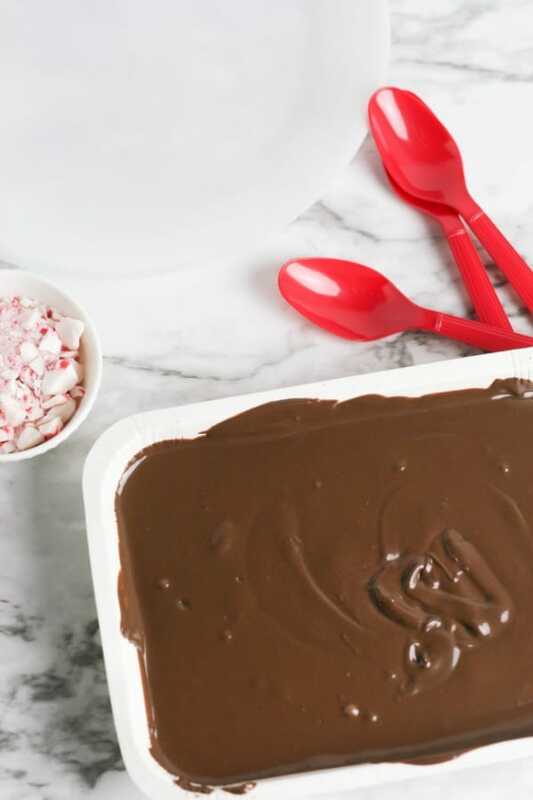 Then, just sprinkle some of the crushed peppermint candy pieces on each spoon. Set the spoons on a paper plate or on parchment paper to let the chocolate cool and set. Once the chocolate has set, slide each spoon into a small plastic bag. 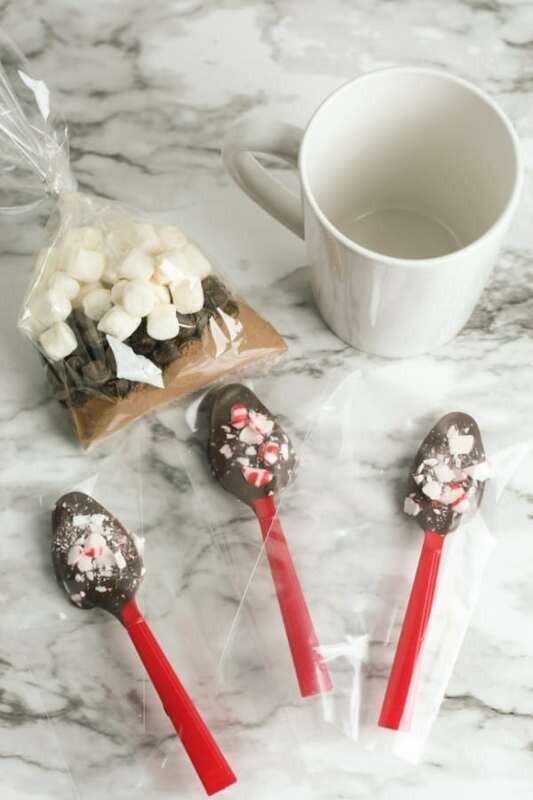 Now we just need to package up our DIY Hot Chocolate and Peppermint Spoons to turn it into a present. Place the cocoa mix in the bottom of the cup, then add the spoons. Simply punch a hole in the corner and tie onto the handle using a piece of ribbon or one of the colored twist ties from the baggies. That’s it! Your DIY Hot Chocolate Gifts are ready to give to friends, teachers, neighbors, or co-workers. 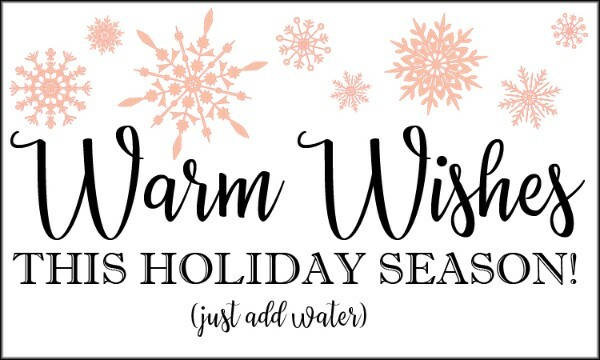 Print off the recipe to keep in your holiday cookbook. Combine sugar, dark chocolate baking cocoa, powdered milk, and salt in a bowl and mix well. Pour six tablespoons of the mixture into a plastic bag. Top mixture with a handful of dark chocolate chips. Top chocolate chips with a handful of marshmallows. Melt chocolate according to package instructions. Dip each spoon into the melted chocolate. Sprinkle pieces of crushed peppermint candy on top. Allow the chocolate to cool completely and set before packaging each spoon it a small clear gift bag. Place packaged hot chocolate mix inside mug. Place packaged spoons inside mug. Cut a piece of decorative cardstock to fit the printable gift tag and glue printable gift tag on top. Attach gift tag to the mug’s handle. Note: Each hot chocolate gift bag includes three servings of hot chocolate. 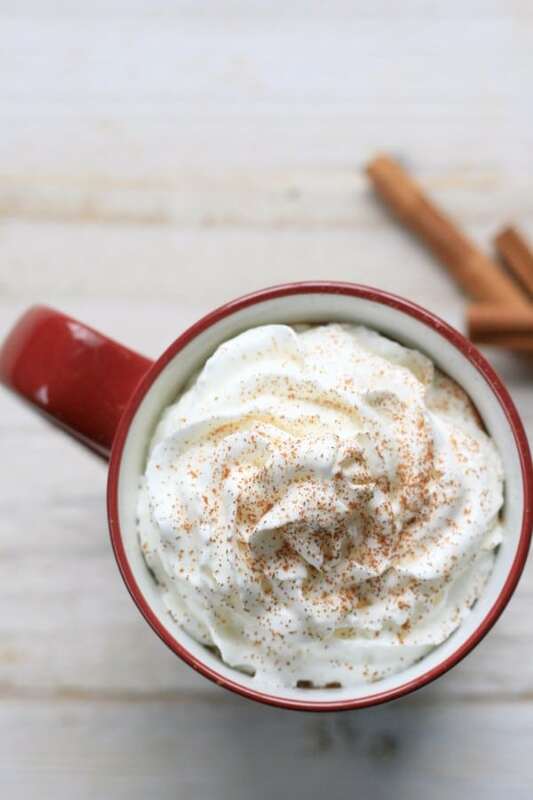 Hot chocolate is a favorite in my house during the winter so it’s one of my go-to winter and Christmas ideas. 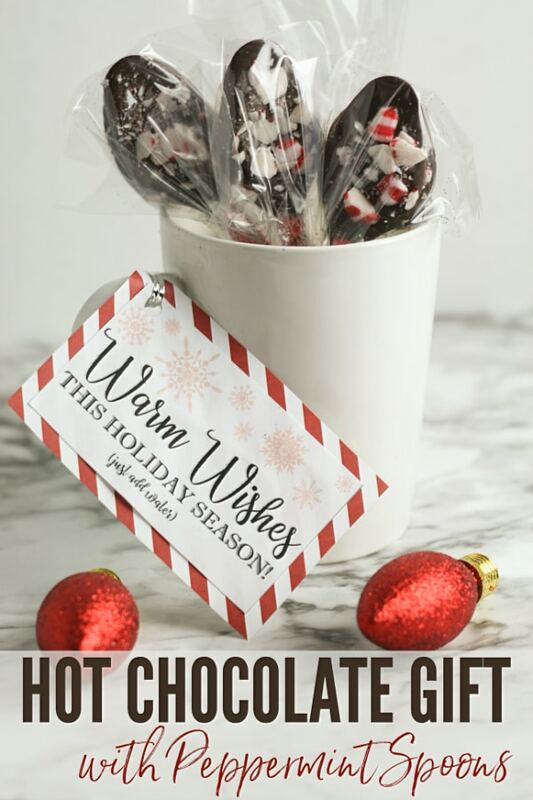 Here are some more hot chocolate inspired gifts and recipes. 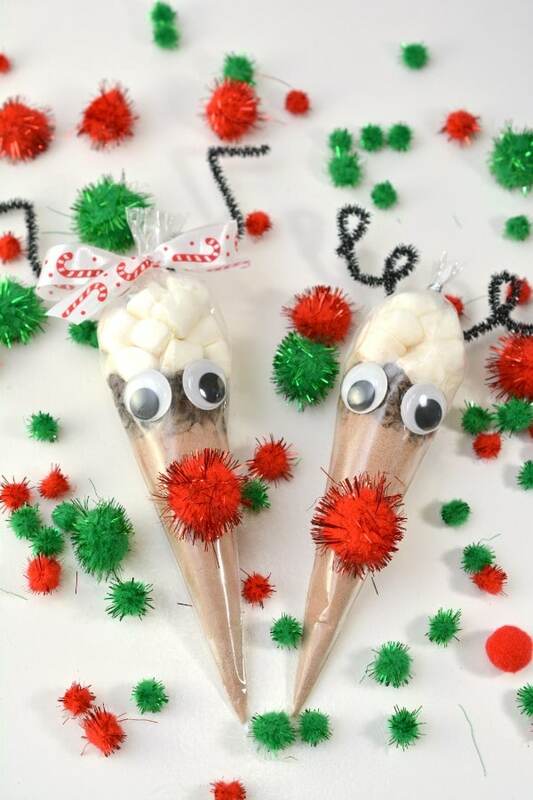 If you’re gifting young children, you might prefer these Reindeer Hot Chocolate Gift Bags. Want to kick your hot chocolate up a notch? Try this Mexican Hot Chocolate. These make such cute gifts! And they’re so easy to make, too, which is great. 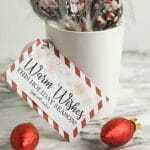 Thanks for linking up at Merry Monday; I’m going to include your Peppermint spoons in my Party Features next week. Merry Christmas! First off – LOVE the wonder woman logo 🙂 I love these spoons and I’m so excited to have these recipes to add to my list. Thanks for sharing them. I LOVE this idea! I like the spoons and how they look inside the cup too. And, it’s something that my kids and I can do together. Thank you for sharing this idea!